Based on the recipe printed in Gourmet magazine December 1994. 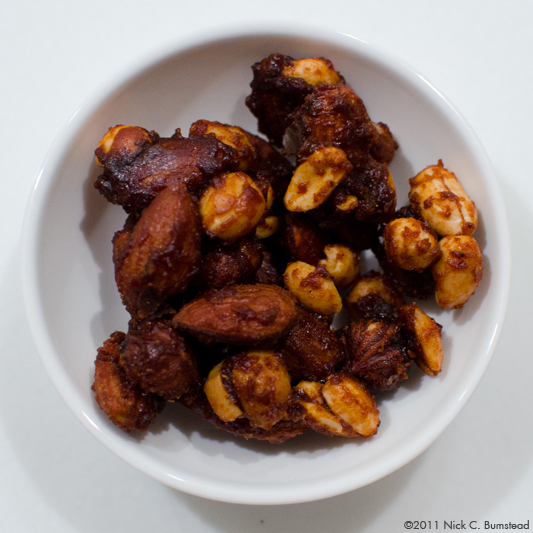 The original includes pecans instead of peanuts and only uses cayenne. The recipe has some back heat, but not too much. It's definitely rounded out by the sweetness from the sugar. 2) Beat egg whites and salt with an electric mixer until very foamy. 3) Gradually beat in sugar, Worcestershire sauce, and spices. 4) Stir in nuts and butter, combining well, and spread in a large shallow baking pan. Make sure there is a single layer of nuts. 5) Bake nuts in middle of oven, stirring every 10 minutes, until crisp and golden, about 30 to 40 minutes. 6) Spread nuts on a sheet of foil and cool. 7) Break up nut clusters. Nuts can be stored for a week in a airtight container. Obviously perfect for enjoying with cocktails, but they really enhance the flavors of a well-made Manhattan. Love this wine, it's truly brilliant -- 40% Chardonnay, 30% Pinot Grigio and 30% Sauvignon -- orange, rich, tannic, peach skin, apples, nuts, herbs. The bottle is unique, the neck is narrow and the cork tiny. Paired with Chicken Faux Gras and Garlic Chili Crab Dip. Found by my friend in his fathers basement -- probably untouched since purchased for a pittance in the early '80s. 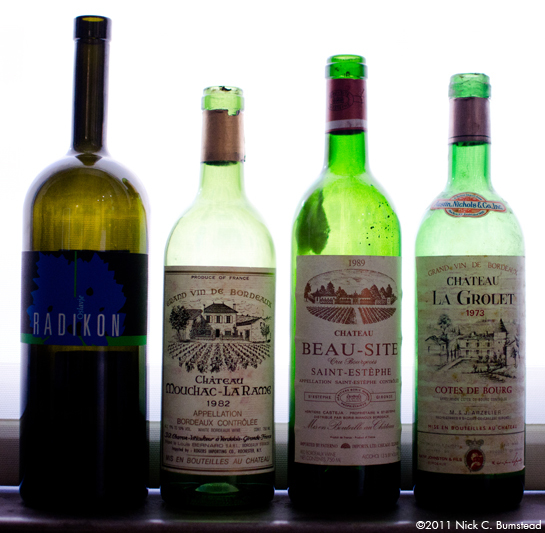 Sometimes it can be really fun to taste a well stored aged wine that was never meant to be something. 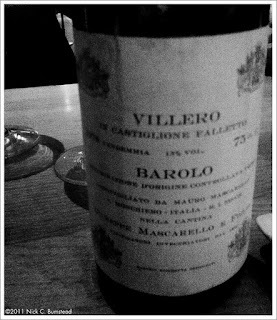 Youthful and aged in the same taste. It worked well after starting with the Radikon. Structured, young, vibrant, mineral, like crushing blackberry on graphite and slate with a hint of smokiness. Paired with roasted guinea fowl, roast potatoes, roast brussels sprouts and celeriac puree. Also paired with stilton and cheddar cheeses. Very light, better nose than on the palate, but interesting nonetheless. Not much sense of fruit left, but definitely some tertiary flavors. 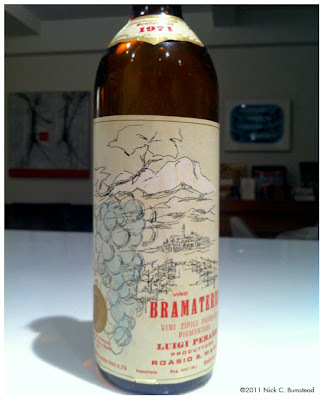 A delightful wine - light, elegant, not much weight or fruit, started out a little stinky, but blew off. Mushrooms, rose, tar -- classic stuff. Paired with roasted rack of pork from Dickson's Farmstand Meats. Patti Smith performing at the MoMA in the atrium in celebration of Jean Genet's 101st birthday. Take a classic vodka martini recipe, skip the twist, skip the olives, add a little Vienna sausage, and you have the Joe Beef Sausage Martini. This fantastically fun recipe sparked me to laugh when I read it in their new book: The Art Of Living According To Joe Beef. The ingredients are vodka, dry vermouth, some of the sausage juice, Tabasco sauce and garnish with a Vienna sausage -- get the ingredients. 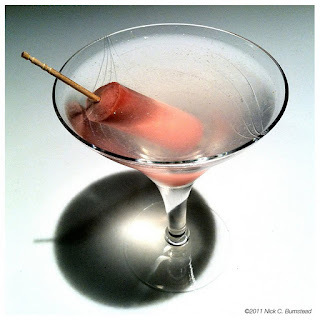 If you haven't had a Vienna sausage in a while, the smell from the can might surprise you, but can you really beat having a little meat in your martini?